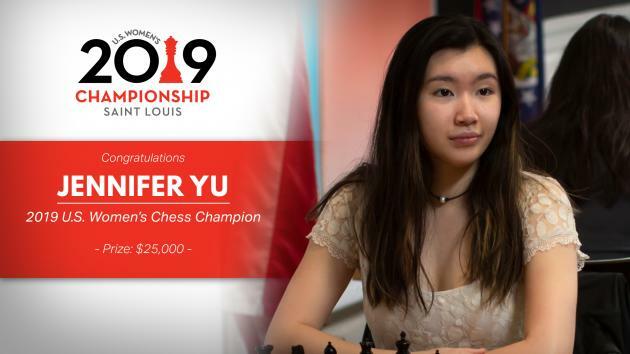 WGM Jennifer Yu, the 2019 U.S. Women's Chess Champion. All graphics courtesy the Saint Louis Chess Club. After many years of the field being comprised of half teenagers or more at the U.S. Women's Championship, one of them has finally broken through. WGM Jennifer Yu defeated IM Anna Zatonskih in round 10 to clinch the 2019 title with one round to spare. She's the wire-to-wire winner and the first teenager to take first place since WIM Elina Groberman in 2000. Yu ran her score to an astounding 9.0/10 en route to the $25,000 first-place prize. She said her parents may take a slice of for college. Near-perfection must be in her DNA; her SAT score was 1580 out of 1600. Jennifer Yu defeated Anna Zatonskih today to make her Sunday is a day of rest. She's already clinched the 2019 title. Photo: Lennart Ootes/Saint Louis Chess Club. She already has all of her IM norms, so Sunday's final round will be just a victory lap for Yu. Today she didn't expect to be able to finalize things ("I was just hoping not to lose"), and apparently Wikipedia didn't either. Although someone entered her name as the winner, she has no Wikipedia page yet. Somebody get on this for Yu! Screenshot: Wikipedia. Update 3/31/19: Some took this challenge and ran with it! Yu seemed to obtain good chances today after nifty tactic on f2. Still, the youngster questioned whether that was enough. "I didn't think I was going to win this," she said following the tactic. Yu, all alone at the top. Photo: Austin Fuller/Saint Louis Chess Club. That tornadic bishop didn't stop, offering itself again on g3. This one also came with check, and with the potential to take the final kingside pawn. The second sacrifice was accepted, but Zatonskih's king was mated shortly thereafter. "I thought today is where she really showed that she's a champion," GM Fabiano Caruana said about result on the other side of the room. "To win at the critical moment is a skill that very few people have." Yu's first U.S. Women's Championship five years ago netted her merely 2.5 points. She's tallied a bigger final score every year since then, and now has the chance now to quadruple that score in 2019. "This is insane," she said. Chess.com's video interview with Yu. What advice would she give to young girls about staying with chess as they grow older? "This is hard but it's worth it in the end," Yu said. "I can't imagine my life without it." Her chess day wasn't done as young celebrity and New York K-3 Champion "Tani" challenged the new women's champ to a few games. Photo: Lennart Ootes/Saint Louis Chess Club. The loss was costly for the veteran. Not only will Zatonskih not pick up her fifth title, she will now have to hang on just for second place. WGM Tatev Abrahamyan closed to within a half point after beating WGM Sabina Foisor, while WIM Annie Wang is within one point after beating FM Carissa Yip. The women continue to give fans what they want: wins. They chipped in five more today to make it 42 wins from 60 games, or 70 percent. It's also now official: GM Irina Krush will finish with a minus score for the first time since 1995. That's quite a run of success. You can see no one is catching Yu. Where the women bring clarity, the men bring uncertainty. Three world-class players are now tied atop the standings with one round to go after GM Fabiano Caruana won to equal GMs Hikaru Nakamura and Leinier Dominguez, who drew each other today. All have 7.0/10. Fabiano Caruana has finally caught up to the leaders. Photo: Austin Fuller/Saint Louis Chess Club. Caruana began the day trailing by a half point. He's been the leading advocate of the Petroff Defense the last few years, but today he relished being able to play against it. "Aleks is very diverse in his opening choices...the Petroff caught me a bit off guard," he said about his tilt with GM Aleks Lenderman. "I wasn't displeased." The win made the world number two come even with both Nakamura and Dominguez, who drew without many fireworks. "Leinier didn't really take any risks in the opening," Nakamura said. He thought there might be one moment to mix things up, especially after 20. Qf4, but it never came to be. Speaking to Chess.com, he said that obtaining the strong center was merely a moral victory. "I think Garry [Kasparov] said some time ago, 'If you get the center, that's a good start," Nakamura said. The problem for the American is that the armies had been too far reduced for the center to mean anything. Dominguez is sitting in the catbird's seat with the best matchup mañana. Photo: Lennart Ootes/Saint Louis Chess Club. This was his last turn with White, as he will face GM Jeffery Xiong tomorrow. Caruana also has black, versus defending champion GM Sam Shankland. Only Dominguez will enjoy White tomorrow, and he gets the lowest-rated player, GM Timur Gareev (who won today). "I think Hikaru and I really want to get into a playoff because we're obviously in a worse situation," Caruana said. That trio of matchups crystallized things for Nakamura. "I think it's pretty clear I better win," Nakamura said. He offered Dominguez as an 80 percent favorite to win tomorrow (Caruana was less precise and called a Dominguez win a "strong possibility"). Both Caruana and Nakamura are hoping for solid chess from Gareev tomorrow. Photo: Lennart Ootes/Saint Louis Chess Club. "Nobody thought then much about my abilities," Gareev said. Here's the push for first, where even GM Wesley So is not technically out of it. If he wins and three top-20 players all lose on the same day, that manic Monday playoff would be the required chess viewing of the year. Also today, boy-wonder Tani stopped by the studio. Caruana and Nakamura will be trying tomorrow to place higher in the tournament than they did on Tani's list of favorite chess players. Not only was Tani on the live show being interviewed, he also played some Puzzle Rush with co-collaborator GM Cristian Chirila. They scored 33 by alternating puzzles, with Tani needing a stool to be a good partner. When your partner needs a Puzzle Rush boost. Photo: Lennart Ootes/Saint Louis Chess Club. Here's the full broadcast from today's round. The official broadcast of round nine.